An adrenaline high descent in the narrow parts of Pinios river (Vernezi). The descent has rapids of 3rd-4th degree of difficulty requiring previous experience in rafting. River descent with RAFTS consist of 8 paddlers and one professional river guide. Pinios River is one of the biggest and longest rivers in Greece and although it is not considered to be a mountain river, parts of it flow through the foothills of Mt. Olympus’ massif and Mt. Kissavos. 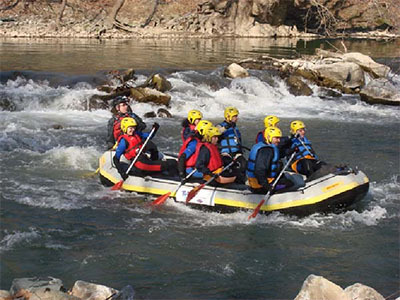 Vernezi: a demanding descent in Vernezi area with rafts of 8paddlers inflatable boats. An exciting challenge to experience ‘‘shooting the rapids’’ of three and four grade of difficulty. It will take your breath away!!! At the end of the Descend, in our suitable shaped space, we will have a rich piknik/bbq and archery as well! Essential conditions: good natural body condition, basic knowledge of swimming. It includes: All necessary technical equipment, experienced Guides, local transfers, picnic/barbeque, and third party insurance.